Place the yeast, 2 teaspoons sugar and the milk in a large bowl and set aside for 5 minutes. The mixture will start to foam, indicating that the yeast is active. Add the flour, mixed spice, cinnamon, butter, egg, sultanas, mixed peel and remaining sugar to the yeast mixture and mix until a sticky dough forms. Knead the dough on a lightly floured surface for 8 minutes or until elastic. Place in a lightly oiled bowl, cover with a clean, damp cloth and set aside in a warm place for 1 hour or until doubled in size. Divide the dough into 12 pieces and roll into balls. Arrange the dough balls in a lightly greased 22cm square cake tin lined with non-stick baking paper. Cover with a damp cloth and set aside in a warm place for 30 minutes or until risen. Preheat oven to 200°C (400°F). My buns turned out very dense. What have I done wrong? Hi, Xenia. Yes, if you are using dried apples. Using freshly grated apple will result in a wet dough that won’t be fluffy. The DH Team. Hi, Brittany. We bake using fan-forced oven settings. Thanks! The DH Team. I just wanted to say thank you. I’ve been using this recipe since it was first published and it has become part of our family Easter tradition. It’s a reliable recipe that has always turned out perfectly even the first time I tried it. May I put apples instead of candied fruit? 200 degrees fan forced or conventional oven? I have made these buns with very little success using ‘plain flour’ however I have since repeated making them using ‘bread flour’ and they came out perfect, they tasted great and were lovely and light I have now treated all my neighbours to some and every batch has worked out fine! My daughter is vegan. Does this recipe work with almond milk? 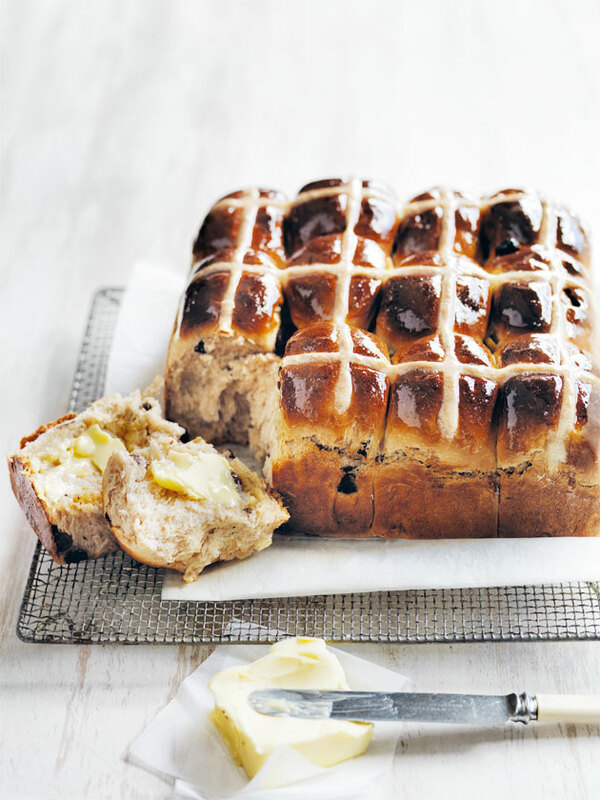 I’d never made Hot Cross Buns before these. I’m doing another batch today with Chocolate Chips. The recipe is simple and delicious!